The Classmate S-950 is a solid machine made to school specifications – but perfect for any type of sewist. The flat bed aluminum alloy construction is made to fit in existing school cabinetry. 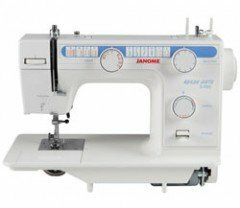 The machine features 19 built-in stitches, including a four-step buttonhole. A threading guide is located on the front panel for easy viewing, and finger guard is affixed to the machine.